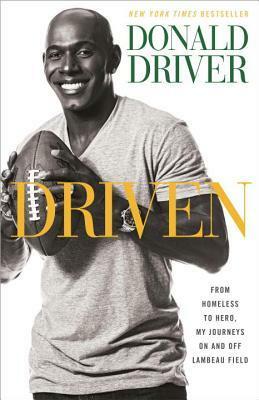 The paper book I decided to bring along with me on my trip to Wisconsin last month was Driven: From Homeless to Hero, My Journeys On and Off Lambeau Field by Donald Driver. What else! I was in the mood for something light and uplifting, and I was heading home for a long weekend, so it was a perfect choice. In Driven, Driver recounts his family’s struggles with poverty during his childhood, his drug-dealing adolescence, and his career in professional football, as well as his winning turn on Dancing with the Stars. Who doesn’t love Donald Driver? He has consistently been a fan favorite for years, and is definitely one of my faves. He just has a bright, good-natured persona, and is bursting with charisma, which was upheld in this memoir. I didn’t really know much about his past, especially the extent to which his family suffered and his drug dealing and car stealing days. Driver’s a very fortunate person and it’s clear he doesn’t take it for granted, and it’s wonderful his tenacity and patience has paid off. It was a real thrill to read about a player’s view of some Packers games that I remember watching or attending, and I was touched by Driver’s close friendship with Brett Favre. This book made me super excited for football season to start up again! Every fan of the Packers would love this memoir. I think it would also be fantastic to experience on audio, if Driver was the narrator of course, because it reads very conversationally, like he’s just hanging out with you telling you about his life. While I really enjoyed it as a Packers fan, as a reader it has its share of flaws, mainly in the editing. I did find a tiny handful of spelling errors, and there was much repetition. Every time Favre is mentioned, it is reiterated that they were close friends, or that he was the quarterback. (Not verbatim, but you get the idea: “Packers quarterback Brett Favre, my close friend…” “My close friend Brett Favre (who was quarterback at the time) and I…”) This also happened with mentions of his wife Tina. I found the writing during the football chapters much more exciting and engaging than other chapters, not that the parts about his personal life and Dancing with the Stars weren’t interesting, they just didn’t go as deep (ha! get it… he’s a WR…#nerd) as the football writing. Read from July 8 to 17, 2014. This entry was posted in books and tagged family, football, male adolescence, memoir, midwest, non-fiction, packers, sports, wisconsin by kristin @ my little heart melodies. Bookmark the permalink.